When you’re on Twitter complaining about your cash flow and debt, it’s guaranteed to bring out the trolls. Especially if you’re a multimillionaire like Kanye West. After West tried to get people like Mark Zuckerberg to spare him a dime (or a billion dimes), someone did happen to answer West’s call for funds. But it probably wasn’t what he was looking for. 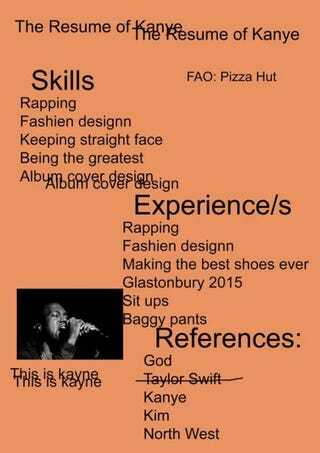 Pizza Hut hilariously mocked up a fake job application—“The Resume of Kanye”—asked him about it and mocked the rapper’s newest album art. Hopefully, West has a sense of humor.